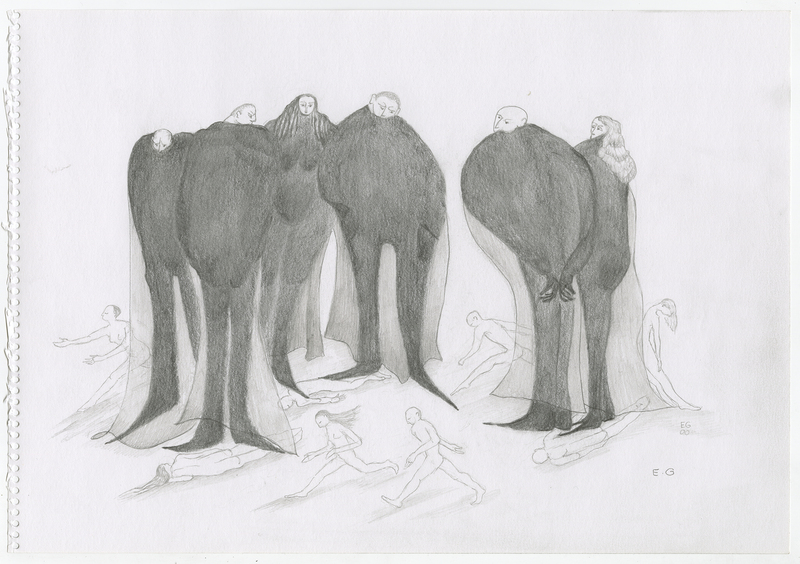 A selection of visionary drawings by Swiss artist Esther Gruber comprise this exhibition. A resident of Basel, Switzerland, for many years now Gruber has filled sketchbooks with drawings, including these, which are being shown for the first time. Earlier in her life, she occasionally showed in Basel galleries and took part in Col-Art (coordinated collective art) in the late 1960s. Although the she was not formally trained, Gruber’s art cannot be considered “naïve”. In Basel, surrounded and informed by some of the finest works of historic and modern art, she draws to some extent from, but also beyond, her exposure to the work of other artists. Gruber creates work that arises from an idiosyncratic outlook incorporating elements of fantasy with narratives that come from daily experiences, dreams, and the worlds of literature and music. The drawings often depict a realm in which the mythical and the modern collide, one perhaps not very far beneath the well-designed and highly organized surfaces that the word Swiss typically connotes but brought to the fore in Esther Gruber’s work. The spirit of this ur-natural world – the world of Basel’s Fasnacht carnival and mythical figure of the Wilde Mann – which so informs her drawings, shows up in the rich and diverse lineage of the works of artists from Lucas Cranach the Elder to Symbolists like Gustave Moreau, Odilon Redon, and Arnold Böcklin. Gruber depicts spiritually and psychologically fraught spaces; forests, claustrophobic settings, post-apocalyptic scenes, rocks and sea. Her drawings are often disquieting; they depict situations containing familiar elements, but transformed as if in a dream. Transformation, or rather transmutation, is a leitmotiv in Gruber’s drawings: rocks turn into people, people into trees, Edens into hells. Flora and fauna are depicted as most healthy and harmonious before the intrusion of man, which almost always portends or accompanies disaster in her works; one-percenters hector and devastate scrambling crowds of naked underlings, other ominous characters watch a child panicking alone in the perspectival jaws of a street, a sinister pendulum chases figures around a concentric track. Gruber’s idea of the purity of untrammeled nature functions as a touchstone in her drawings as a corrective to, and a keel for, human existence. The tree is a recurring positive symbol in her work, perhaps one with which she identifies; Gruber’s drawings are infused with a personal and animistic spirituality, if not a conventionally religious feeling.